Its narrow depth and wide surface top allows it to provide storage and display without taking away from your living space. Its two doors open to a space with no shelving to provide optimal storage space. Please request a quote and we will contact you within one business day with shipping pricing and availability. Choose from our excellent variety of stains, fabrics and hardwoods to create a unique piece for your home! Whether you are building a new home or remodeling, our trained personnel are here to help you make wise decisions. Many items are in stock for immediate delivery or you may special order an item to fit your needs. Our vast variety of upholstered furniture is available in many choices of sizes, colors, and styles in fabrics and leathers. Our furniture artisans have been honing their skills for generations. Handcrafted furniture reflects the pride of old-world craftsmanship handed down from father to son. Artisans rely on mortise-and-tendon joinery, precise dovetails, and tried and true finishing techniques with a wide variety of finish shades or painted colors to choose from. We also have a large inventory of lamps, wall and table accessories, pictures, and area rugs to complete the room of your dreams. You can also take it with you, at your convenience, as we sell off the floor the items you choose. We kiln dry our own lumber and build to suit your needs. Building a custom mission style sofa takes time. Please allow our craftsmen 8 to 12 weeks for delivery. Many of the mission style sofa’s also have matching loveseats and chairs. Some even have matching solid wood glider chairs and solid hardwood rocking chairs. We can stain all the pieces for a perfect match! Feel free to order online and we will ship you samples in the mail. This means getting a couch that excels in elegance, durability and comfort. The frame is solid wood construction with a solid back and wood inlays to add a classic feel. Styled with custom selected upholstery and handcrafted solid wood legs. They’re all quality built from the inside out. And they start with a solid hardwood frame. Plus all the special cabinetwork — such as slats and mortise and tenon joints — showcase the finest cabinetwork. Plus, some of our styles fall somewhere in between. Custom options include ottomans, storage drawers, and leather upholstery. Browse attractive upholstery fabric choices, including leather, multiple hardwood selections, and other appealing upgrade options. Handmade with your own customizations including extra thick cushions, ottoman, pillows, and gorgeous fabric or leather upholstery choices. Customizations include nine hardwood species, an array of upholstery fabric selections, throw pillows and a leather couch upgrade. Amish sofa set offers a reclining feature in an armchair, loveseat, and 3 seater couch, with optional power recliner control. Browse other attractive options, including wood and stain choices, pillows, arm pads and leather recliner upgrades. Optional ottoman and stain customizations. Tapering legs give an hourglass shape, while plump pillows and cushions portray splendor. Many stain and upholstery customizations available, including leather. 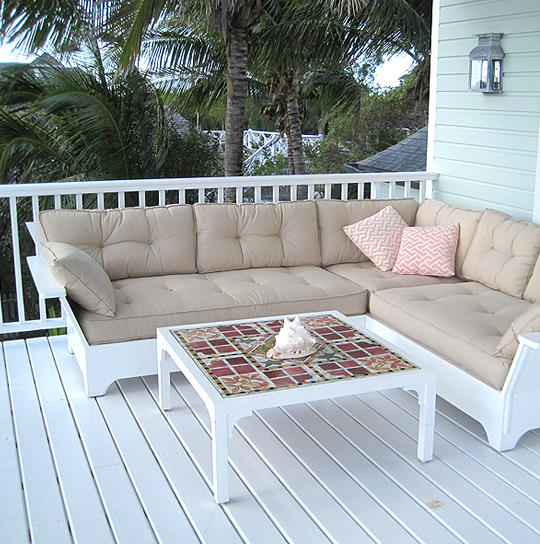 Make this set your own by selecting from our wide variety of wood stains and upholstery, including leather. Gliding curved armrests and tapered legs with exposed mortise and tenon construction, and wide arms; this is a classic shaker style set. Choice of an ottoman, pillows, and low or high back on select pieces. This premium collection offers reversible cushions, optional ottoman, and an 18" throw pillow on select items with your choice of exceptional fabric. Featuring a bowed arm seating set with craftsman curved corbels and elongated arch bases. Because you want seating that’s comfortable, durable and great looking. Amish artisans build our seating products around a solid hardwood frame. The beautiful hand turned posts give the glider an elegant appearance. Also, the glider has an optional flip-out footrest. The sofa has a curved arm with wide slats along the sides and back. The unique square legs and curved cross piece of the collection, offers a modern style to these pieces. The loveseat has a flat arm that is even with the back. Also, the loveseat features a series of slats that are along the sides and back. The sofa has a flat arm that is even with the back. Also, the sofa features a series of slats that are along the sides and back. The loveseat has a flat arm that is even with the back and accent pieces aligning the posts. The sofa has a flat arm that is even with the back and accent pieces aligning the posts. The sofa has a curved arm with corbels and through tenon. The sofa has one horizontal slat along the side and a series of them in the back. Also, the sofa features a coil spring seat for added comfort. Also, the loveseat features reverse panels along the sides and back. Also, the sofa features reverse panels along the sides and back. The loveseat has a flat arm that extends past the back. Also, the loveseat features a series of slats along the sides and back. The sofa has a flat arm that extends past the back. Also, the sofa features a series of slats along the sides and back. The loveseat has a flat arm that is beveled around the edge. Most important of all, the loveseat is constructed out of solid hardwoods. The loveseat has a bent arm that is beveled around the edge. Also, the loveseat features a series of angled slats and legs. The sofa has a bent arm that is beveled around the edge. The sofa has a flat arm that is beveled around the edge. Also, the sofa features a series of angled slats and legs. Most important of all, the sofa is constructed out of solid hardwoods. The loveseat has a curved arm with a reverse panel side. Most important of all, the loveseat frame is constructed out of solid hardwoods. The sofa has a curved arm with a reverse panel side. Also, the sofa is available with an optional power mechanism. The loveseat has a curved arm with a series of slats on the side. The loveseat features two wall hugger recliners. Also, the loveseat is available with an optional power mechanism. The sofa has a curved arm with a series of slats along the side. The sofa features two recliners on the ends and a stationary seat in the middle. The curved posts give the glider an elegant appearance. Most important of all, the glider is constructed out of solid hardwoods. Also, they hone the frame from solid hardwoods along with traditional woodworking methods. These include the fabric, wood species and stain/paint/dye choices. Now the only question is which of the many loveseats or sofas is your first choice! Amish sofas come standard with the fabric or microfiber of your choice. Lleather, premium fabric upgrades are available as well as providing your own upholstery grade fabric. Choose your style and cherish your handcrafted living room seat for years to come. With an array of premium fabrics options you can custom-create a handmade sofa that is all your own. Choose from the latest colors, patterns and textures. With its distinctive grain and texture, it is also hard to top the classic elegance of genuine leather. Solid hardwood sofa frames provide durability and structure, while high density foam cushions and your upholstery selection adds comfort. White to handcraft our chairs and sofas, so you’ll never have to worry about durability. They provide just the right amount of cushion and support. Glancing at all the solid wood furniture we have for sale, you may feel overwhelmed by the many options, ranging from bedroom sets to chairs and loveseats. If your room is less formal, though, you may value comfort above all else. However, once you get the new furniture in the room, you realize the décor you have in place now doesn’t work with your new furniture. Instead of buying new things, look around the house for something you could move into your bedroom to bridge the gap between your new and old furniture. Perhaps you have a table in the entryway made of the same solid oak as your new chair, or maybe there’s a picture with a frame similar in color to your new glider. Instead of buying a new dresser, for example, first try out a new jewelry box for on top of the dresser that will draw the eye. A fresh coat of paint on your walls may be all you need to make your new furniture fit in better. Match a highlight from the wood or try a totally wild color that will complement the new piece. They’ll be used day in and day out, and it’s important to have confidence in their long-term prospects. Whether you’re moving into a new home, embarking on a full-scale home makeover or simply looking to add badly needed home furnishings, you’re sure to find exactly what you’re looking for at our bed furniture outlet.